The third step is to consider how many times a year you would like to be spreading compost on your property. Regulations prohibit spreading of raw manure when the ground is saturated or snowy so weather will likely impact storage time. How many months of storage do you therefore require? You must also consider changes in season. Compost does not break down as quickly in the winter as in the summer due to temperature. 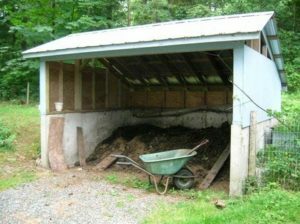 In the summer you may be able to generate compost in as few as three weeks, whereas in the winter it can take much longer. Typically, 6 months (180 days) of storage is required for the Fraser Valley and Vancouver Island. Other parts of BC may need 7 months (210 days) or more of storage. Variations depend on crops grown, soil type, soil temperature and local rainfall. Storage requirements are less on farms where manure is spread on grasslands or well-drained soils. During winter months, storage duration will likely be longer due to decreased temperatures that will slow the composting process. For more information about composting over the winter visit the improve your practices page.